In the fall of 2013, graduate students from the English Department approached their director of graduate studies, Andy Doolen, to solicit his help in building a more robust community of writers. Doolen found was that some of the country’s finest graduate schools invest in shared writing programs similar to what UK’s grad students desired. And once he realized the English Department could offer more to its students than writing boot camps, the Let’s Write! program was born. Let’s Write! is a voluntary shared writing program that involves twice-monthly meetings organized around individual themes, all building toward different writing boot camps throughout the semester. These mini-workshops offer participants a supportive environment discussing and engaging in research and writing. The 2013-2014 academic year featured sessions on research strategies, revision techniques, goal setting and writing toward the job market, among others. Spring semester Let’s Write! 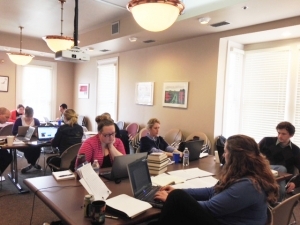 sessions worked toward a new event for English graduate students: a department-sponsored writing boot camp over spring break (supplementing the preexisting boot camps sponsored by the Graduate School). While funding is often the main obstacle for institutions planning a boot camp, the English Department was able to reserve Bingham-Davis House and rely on faculty volunteers bringing in lunch to reduce costs. Participants in the spring break writing boot camp committed to working from 9 to 5 each day during the break, writing with a focus on the projects they had been planning during previous Let’s Write! sessions. Doolen says he was encouraged by the high demand for the boot camp and the participants’ decision to focus on work when many would take a break. For Doolen, this level of student involvement in Let’s Write! has been the program’s biggest surprise and the best evidence of its value. “I thought 8 or 9 people would do it. We have 19 registered participants, and that’s important to note. Our students teach a lot, but they felt this could help them become better scholars. They don’t have to be there but they’re showing up, and that shows me that people find it very useful,” he explained. Let’s Write! is preparing for its second year, maintaining the same meeting structure with the goal of guiding graduate students through the process of writing, revising and submitting a journal article or dissertation chapter. Participants will read each other’s work and offer feedback in workshops, continuing to prepare for writing boot camps and develop effective writing strategies. After a successful introductory year, Doolen has high hopes for the second Let’s Write! program. “I think everyone is the program is learning from each other. What this shows is what everyone knows about a successful graduate program, which is that the real learning takes place among the graduate students: the veterans graduate students teach those below them and the newer students give inspiration to the veterans. That’s how a program becomes healthy and more successful,” Doolen said.